Gord Downie's solo double album Introduce Yerself is set to arrive tomorrow (October 27), and ahead of time, listeners can look into the studio session that birthed the record's closing track "The North." 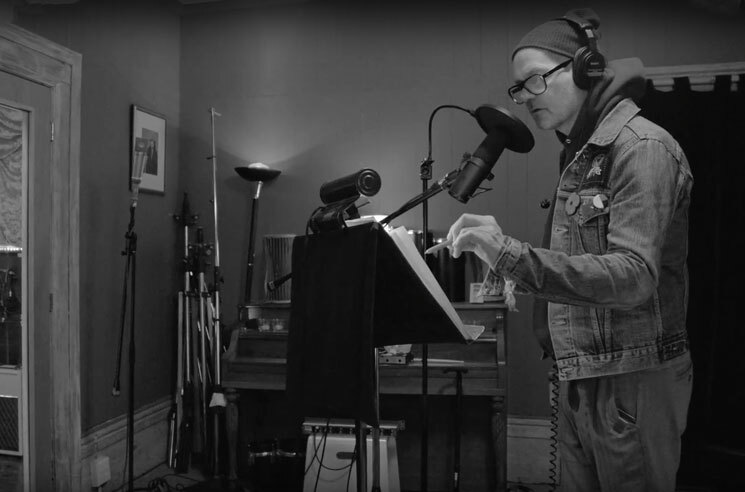 The clip, from directors Jennifer Baichwal and Nicolas de Pencier, finds Downie and producer Kevin Drew laying down the vocal track for the song at the Tragically Hip's Bathouse studio in Bath, ON. "A lot of these I wrote the words in advance," Downie said of the material in the video. "Like poems. I'd get one or two a day and then I'd have to stop. Because that's about all… the soul or whatever, would give up. And then, so with music, it becomes pretty easy." Downie had said that each of the 23 songs on the record are about a person. Our review of the record notes that Introduce Yerself "finds Downie fully, completely and unequivocally himself, undoubtedly a comfort for listeners who will continue to celebrate his life and legacy going forward." Downie passed away at age 53 on October 17 from glioblastoma, an incurable form of brain cancer. Introduce Yerself officially arrives through Arts & Crafts at midnight tonight (October 27). Go behind the scenes of the studio session in the player below.